To the casual observer, mid-June may not seem like the ideal time to explore the science of ancient ice. However, last month, as the hot sun beat down outside, a dozen geoscience professors donned boots and thick red parkas to brave sub-zero freezers and learn the secrets embedded in ice many thousands of years old, from the coldest places on Earth. It might be easy to agree that global climates are changing, but what's driving the change is a much more controversial topic of conversation. Climate scientists are confident that human activity is a main driver, but how did they come to that conclusion? Research at places like the National Ice Core Lab in Lakewood, Colorado, help provide answers. We are interested in project stories and news from the ice coring community. Please contact us if you are interested in submitting a story or news item to In-Depth. This winter, when many people's imaginations were fixed on the North Pole, a small group of scientists has been working on the other side of the planet. In round-the-clock daylight and frigid temperatures, glaciologists have been drilling an ice core at the South Pole. Drilling continues through the end of January for the first of two years of a joint project by the University of Washington and the University of California, Irvine. The National Science Foundation is funding the South Pole Ice Core Project to dig into climate history at the planet's southernmost tip. Brian Bencivengo: Farewell & Thanks! 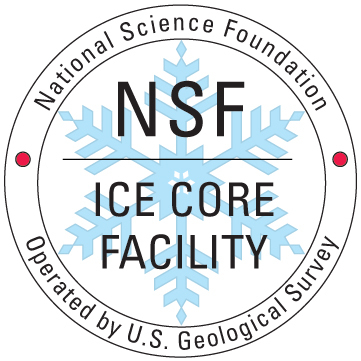 The National Ice Core Lab – 2013 and Beyond! It's a scene that's been repeated for the last several summers in the Denver metro area: People bundled in thick coats, wool hats and heavy boots – as if ready for an arctic adventure – step into what appears to be a white-walled workshop. There are table saws and planers and less familiar instruments, including a device that sports electrodes. This is the ice core processing room for the National Ice Core Laboratory at the Denver Federal Center in Lakewood, Colo., with an ambient temperature of minus 24 degrees Celsius. It's a freezing cold day inside the National Ice Core Laboratory (NICL) in Denver, Colo., as it is every day of the year. That's because the NICL is a facility for storing and studying ice cores recovered from the polar regions of the world. It's minus 23.3 degrees Celsius (minus 10 degrees Fahrenheit) inside, so everyone is bundled up in ski parkas, insulated gloves and boots. And, saws are buzzing, as scientists from all over the U.S. are measuring and cutting pieces of precious Antarctic glacier ice to take back to their labs for research. It took a month to prepare for a week's worth of work at the National Ice Core Laboratory (NICL) in Lakewood, Colo. It was a long time in coming. But the final sections of ice core from the West Antarctic Ice Sheet (WAIS) Divide were sliced and diced in mid-June, with samples of ancient ice destined for labs across the country to analyze the paleoclimate record. About 75 meters of ice were processed through NICL after the hole was deepened this past field season.